START YOUR YEAR WITH A BONUS ANG PAO FROM GRABHITCH! Know a friend who drives? 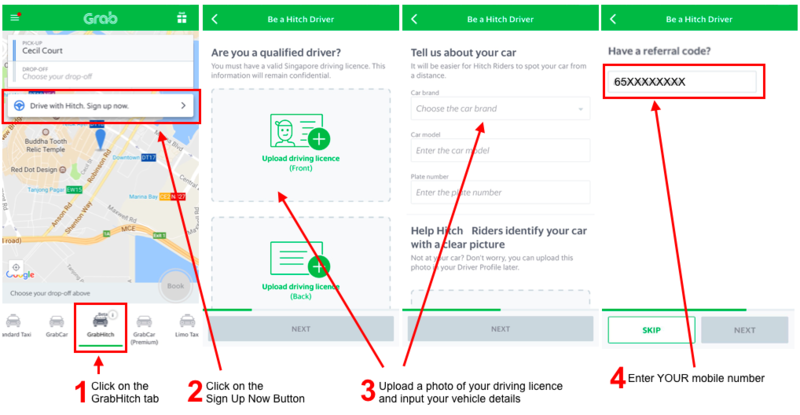 Help us – help you, invite more drivers to join the GrabHitch community! Our Hitch drivers are often regular morning/evening commuters with full time jobs, just like yourself. They choose to give you a ride because you are going along their way, and so that they can save you some time and reduce your travelling cost. To make it easier for you to get a ride, we definitely need more of them! Chinese New Year is just around the corner! For the month of January, get $20 in Grab promo codes (for every driver you invite to our community) + a BONUS ANG PAO AND your referee will get $20 in his/her Hitch driver wallet + a BONUS ANG PAO as well. Each Bonus Ang Pao is worth between $8- $28, given at random so may you be lucky always! *Terms and Conditions Apply. HOW TO: Refer a friend who drives, in less than 5 minutes! Get YOUR FRIEND to open the GrabHitch tab on the GRAB App. Click on the Sign Up Now button to start signing up! Upload a photo of your driving licence and input your vehicle details. Make sure YOUR Grab-registered mobile number (include 65 in front e.g. 65xxxxxxxx) is included in the Referral Code field (see screenshot). Make sure you encourage your friend to do a ride by 31st January 2017 so that both of you qualify for your rewards! The $20 promo code for referrer / $20 credit for referred scheme runs from 1st January 2017 @ 00:00 hours – 31st January 2017 @ 12:00 hours. January 2017 Bonus: Qualifying referrers are limited to a maximum of ONE Bonus Ang Pao per referrer only i.e. Referrers who have referred 8 friends will receive ONE Bonus Ang Pao. January 2017 Bonus: Referred friends have to complete their 1 ride before the incentive period ends to count as a successful referral. Passengers will only receive their $20 Grab Promo Code and Bonus Ang Pao if their referred friend successfully completes ONE GrabHitch ride as a driver by 12:00hrs on 31st January 2017. After the referred driver has completed his/her ride as a driver, please allow up to 10 working days after the incentive period has ended (ie. post-31st January 2017) for the $20 Grab Promo Code and Bonus Ang Pao to be processed and given to you. The $20 Grab Promo Code incentive received from this scheme can only be utilised for GrabCar or GrabTaxi rides within Singapore. A maximum of 1 Bonus Ang Pao will be given to each Passenger, regardless of the number of drivers referred. Bonus Ang Pao credits will be given at random to each referrer in Grab promo codes. Drivers have to sign up with the Passenger’s mobile number (include 65 in front e.g. 6512345678) and do ONE successful GrabHitch ride as a driver by 12:00hrs on 31st January 2017 to count as a successful referral. After completing your 1 GrabHitch ride, please allow up to 10 working days after the incentive period has ended (ie. post-31st January 2017) for the $20 credit and Bonus Ang Pao to be transferred into your GrabHitch driver wallet. The Driver’s $20 credit and Bonus Ang Pao incentive cannot be converted into a GrabCar / GrabTaxi promo code and can only be transferred to the Hitch driver wallet. Bonus Ang Pao credits will be given at random to each referee and will be credited into his/her Hitch driver wallet.